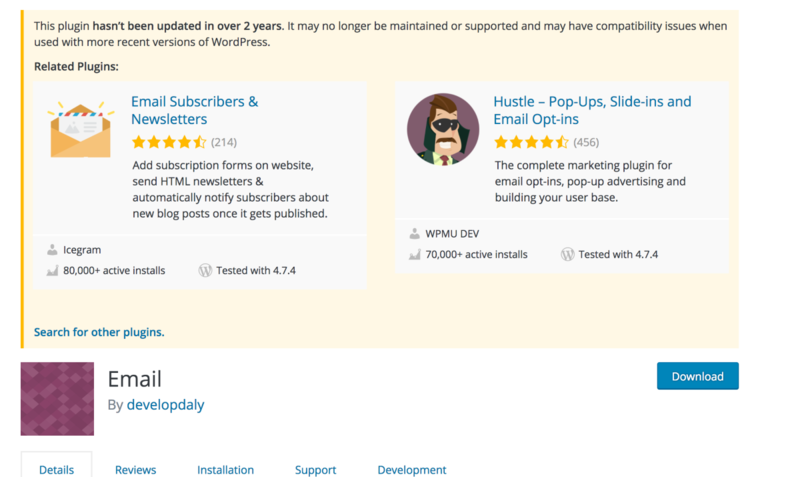 There is currently a banner on any plugin that hasn't been updated in two years. We should be able to add related plugins to this section to guide the user in a better direction. This screenshot also shows a "Search for other plugins." link which just links to the search page at ​https://wordpress.org/plugins/search/email/ (just using the plugin's slug as a search string). Not great, but it is easy. Eventually we could have a page at /plugins/SLUG/related that we link to instead. This search link could use some CSS/Design help/ideas/language. The algorithm for related plugins isn't figured out yet (the above screenshot was hard coded with plugin IDs selected based on search), but this should be a pretty easy query to build. The downside to this approach is that it pushes the main plugin down the page a lot, but by reusing the existing search cards it is pretty easy to implement. @tellyworth I think we should leave this open. The screenshot is from a patch I have where I hardcoded the results. Now that JP Search code is live it should be pretty easy to add an algorithm to power the UI and get this live (once I can get back to working on .org). I'm hoping to get this live by the end of the year. Some discussion on the UX or whether there are problems with this approach would be great though.